"MA2 Mike Monsoor, a Navy Seal, was awarded the Congressional Medal of Honor posthumously for jumping on a grenade in Iraq, giving his life to save his fellow Seals. During Petty Officer Monsoor's funeral in San Diego, as his coffin was being moved from the hearse to the grave site at Ft. Rosecrans National Cemetery, SEALs were lined up on both sides of the pallbearers route forming a column of two's, with the coffin moving up the center. 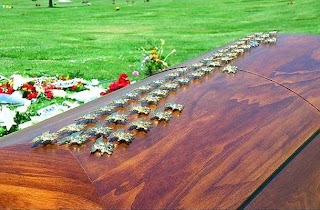 As Mike's coffin passed, each SEAL, having removed his gold Trident from his uniform, slapped it down embedding the Trident in the wooden coffin. The slaps were audible from across the cemetery; by the time the coffin arrived grave side, it looked as though it had a gold inlay from all the Tridents pinned to it. This was a fitting send-off for a warrior hero." Thank you, Petty Officer Monsoor, for your service and sacrifice. And thank you to your brothers in arms, who teach us that some things are worth dying for. Amen. Fair winds and following seas, MA2. Godspeed, Petty Officer Monsoor, and thank you for your sacrifice.